You are here: Home / Dryer Fire Prevention / Is Your Dryer Vent Hose a Potential Fire Risk? Do you have the wrong hose connecting your dryer vent? 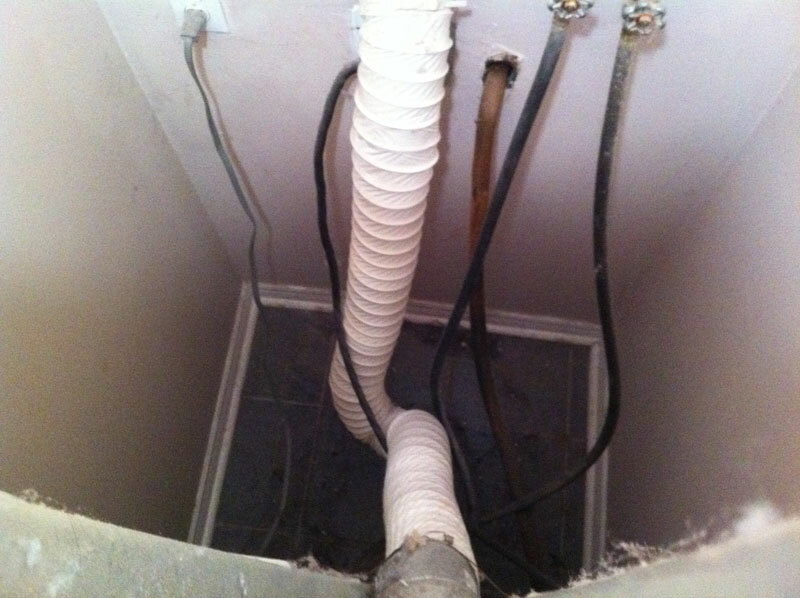 The chances are you do as we see a lot of dryer vents and dryers that are using the WRONG DRYER HOSE! That’s wrong determined by the actual dryer manufacturers themselves not us. By having the wrong dryer hose on your dryer it could invalidate your dryers warranty in the event of any warranty call for an issue. When we go to homes to carry out dryer vent cleaning we see this all the time. On the back of all modern dryers (missing on some older ones) there is a warning label that states not to use plastic of thin foil hose yet most people are using thin foil and vinyl in older homes. Why is this such a big deal, well if ever a fire took place and your insurance company wanted an excuse not to pay out they have a valid excuse. It states clearly in black and white not to use vinyl or thin foil hose. Whats Wrong With My Dryer Hose? Vinyl hose or thin foil hose that most leading stores sell are against what the dryer manufacturer recommends yes they quote they are UL2158A rated but they are not all metal the so called foil is a laminate that contains plastic. 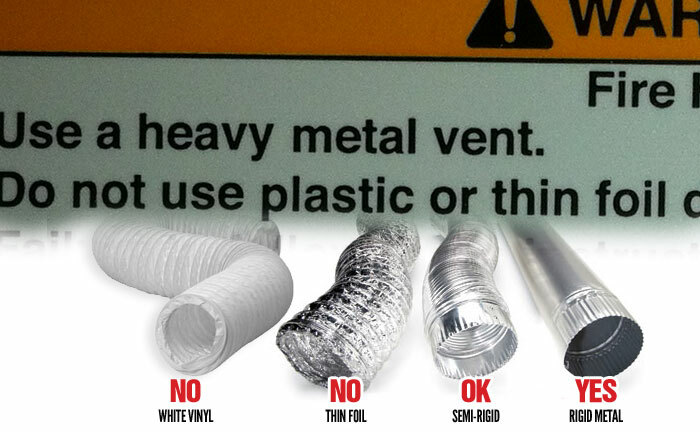 Thin foil hose or vinyl should not be used, the dryer warning label and owners manual say so. We cannot fathom out why they sell them as dryer vent hose when they should not be used. In the USA there were several class action suits against the box stores. May 21 2008 (Reuters) – Appliance retailers Sears Holdings Corp (SHLD.O), Lowe’s Cos Inc (LOW.N) and hhgregg Inc (HGG.N) were charged with improperly installing dryer vents in federal lawsuits seeking class-action status on Wednesday. The lawsuits state the retailers’ installers attached metal foil or plastic vents to dryers sold to consumers instead of heavy metal ones recommended by manufacturers, creating conditions that could cause fires or death. The suits seek unspecified monetary damages and corrective action for consumers whose vents were installed improperly. Appliance retailers typically charge a fee for installation. Dryer Warranties Could Be Voided With Wrong Hoses Used! It was determined in the HHgreg lawsuit that dryer manufacturers could void the warranty should they recognize the wrong hose was used to connect the cryer to the wall. By ignoring the warning, the suit says, the company voided manufacturers’ warranties and created a dangerous situation in which the dryers could catch on fire or cause other safety problems. Despite the warning labels clearly displayed on the back of dryers Ontario’s appliance stores still offer to install dryers with the wrong, NOT recommended hose! Ok they are not installing the white vinyl hose, but the thin foil they are always using is so wrong criminal in fact! It is not that they cannot see the large warning label as they have to go behind the dryer whilst hooking up the dryer. Be warned your dryer manufacturer may void warranty work if you have the incorrect dryer hose connecting our dryer to the wall! Many people with the wrong dryer hose do not know where to call to get their vinyl hose of thin foil hose changed over, for anyone in Ontario looking for a reliable professional company why not call Dryer Vent Cleaner?